Ideally you want a jersey that will hug your torso and arms without leaving excess fabric flailing in the wind. This is an especially important consideration if you’re a competitive rider.However, you don’t want a jersey that’s so tight it becomes a source of discomfort. Many riders opt for jerseys partially or fully made from fleece because of how soft and gentle it is on the skin. A number of jerseys are made from a combination of several different fabrics in order to afford the rider the best of their attributes. Summer riders will want a mens cycling jersey that offers good ventilation. If this is you you’ll be looking for a jersey that is breathable and allows body heat to dissipate from certain areas. You will also want a jersey that will not leave you clammy with sweat but one which effectively deals with moisture and keeps you dry. The last thing you need when riding competitively is the wind blowing in under your jersey causing it to balloon. You need a shirt with an elastic hem to prevent this. On the other hand if all you envision are leisurely rides over small distances, you can opt for a jersey that fits loosely. A jersey with a full zip is desirable for biking in higher temperatures as you can open it all the way and let the breeze in when it gets too hot. Such jerseys are also easier to take off. For cooler climate you can opt for a jersey with a zipper that opens quarter-way. If you will be cycling long distances and will need somewhere safe to store your wallet, phone, car keys and other valuables, you need a jersey with pockets as most biking shorts don’t have them. 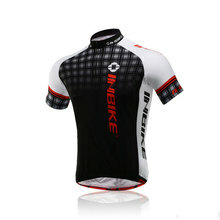 As with most other items of clothing, cycling jerseys come in a variety of colors and designs to suit different tastes. If you want to break with the norm you can go for a retro cycling jersey to draw inspiration from the cycling greats of yore. You can also choose from a selection of jerseys with humorous pictures and writings if you want to raise a few eyebrows. Much as shops, both online and offline, are replete with cycling jerseys of all designs and all purposes there are some that are recommended for serious riders. Pearl Izumi is a trusted name when it comes to cycling gear and their sea-blue Quest mens cycling jersey is not only light and easy on the skin, it’s easy on the eye. 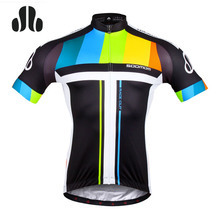 The Primal Wear Men’s Torque Jersey has an eye catching design and is equally light. Where to Buy Mens Cycling Jersey?